It’s been 45 years since humans last stepped foot on the Moon and, in that time, no human being has even traveled beyond low-Earth orbit. NASA currently plans to resume human activities in deep-space in the 2020’s, though the agency is also looking into the possibility of flying its own astronauts again as early as 2019. Meanwhile, SpaceX is aggressively pursuing a plan to send two paying customers around the Moon and back as early as 2018. An artist's depiction of astronauts on the Moon. Image: NASA. This bold approach to space exploration provided some much-needed distraction from the heightened Cold War tensions of the time, but it also gave NASA just 8 years to design and build a Moon landing mission from scratch. At the time JFK made his “To The Moon” speech, NASA was just a year and a half removed from their first-ever human spaceflight—a sub-orbital launch in which Alan Shepherd had spent just 15 minutes and 22 seconds in flight before splashing down in the Atlantic ocean. 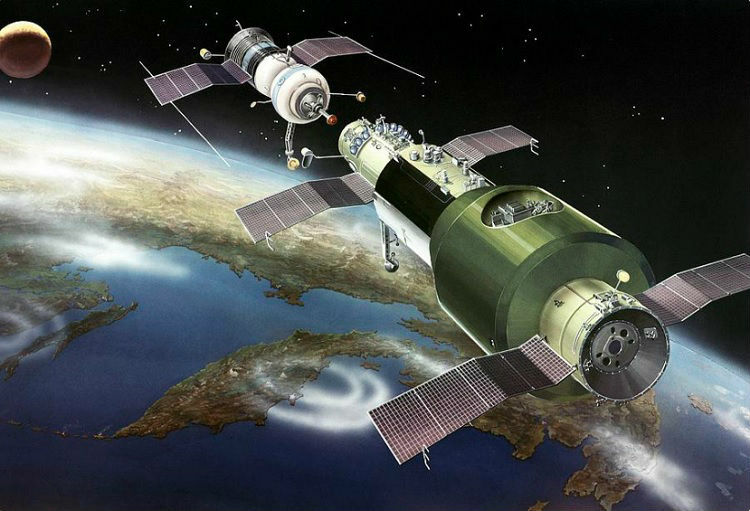 The longest U.S. spaceflight thus far had lasted a total of just five hours; on the other hand, the Soviets had just pulled off a simultaneous flight of two crewed space capsules, during which Vostok 3 spent just shy of four days in space and completed 64 orbits of Earth. It’s unclear whether JFK was actually intent on making the Moon landing a national priority or if his announcement was just some sort of bluff—a maneuver intended to provoke the Soviets into a Moon-race that seemed impossible for either superpower to win. Either way, up until the mid-1960’s, the USSR had been winning the space race. The launch of Sputnik 1 in 1957 had sparked global anxiety over the extent of Soviet technological capabilities, and Soviet rocket scientists and cosmonauts had continued to reach milestone after milestone ahead of their American counterparts. With nuclear tensions also on the rise, JFK may have been looking for an alternative to nuclear apocalypse—a way to slow the doomsday clock that had been steadily ticking away since the end of WWII. Just one month after JFK’s Moon speech, the Cuban Missile Crisis occurred, and the world almost fell into an all-out nuclear war. Astonishingly, after what seemed like a precursor to an unavoidable nuclear showdown, the Americans and Soviets were able to reach an agreement: the USSR would remove its nuclear missiles from Cuba (which were capable of striking Washington and most of the United States), and the USA would remove its nuclear missiles from Turkey (which were capable of striking Moscow and the most populous regions of Soviet territory). Nuclear war was put on hold and, in 1963, federal funding of NASA began ramping-up significantly. For a brief moment in history, the space race took precedent over the nuclear arms race—putting humans on the Moon had become a national priority. 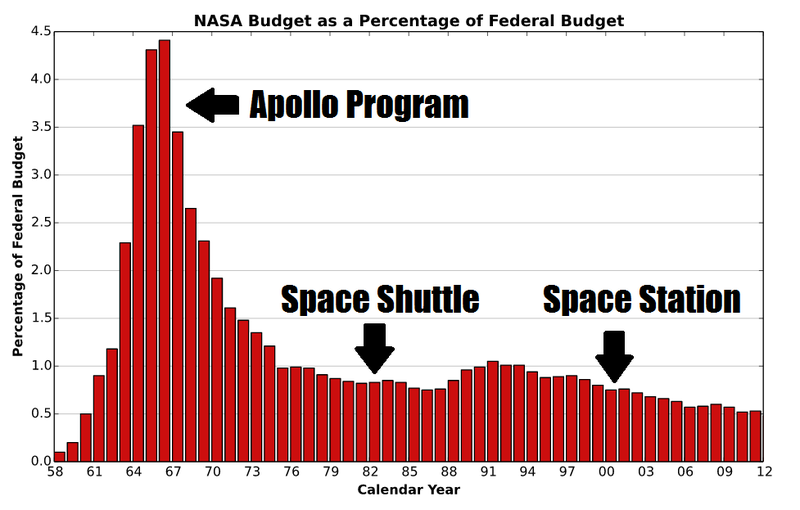 NASA's budget as a proportion of United States federal spending. Image: Wikimedia Commons. During the mid-1960’s, NASA’s budget went from a fraction of a percent of total U.S. government spending to as high as 4.4% of the entire U.S. federal budget. To put that in perspective, if NASA were to receive 4.4% of the U.S. federal budget in fiscal year 2017, that would amount to a whopping $182 billion dollars dedicated to space science. Instead, NASA’s actual 2017 budget is just $19.5 billion dollars—or 0.489% of total federal spending. 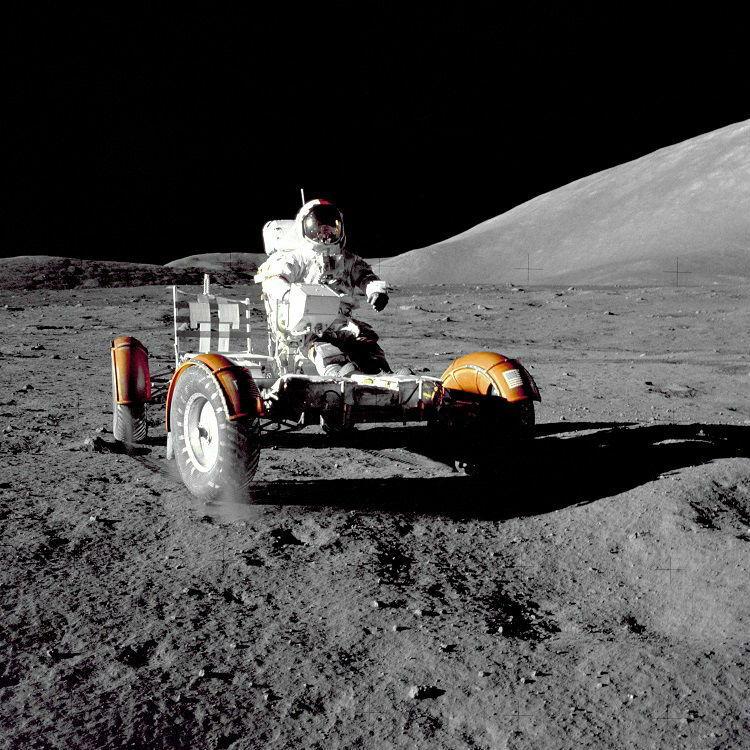 A man driving an offroad vehicle on the Moon nearly five decades ago. Who said space was hard? Image: NASA. As NASA’s budget rocketed through the stratosphere during the Apollo era, the agency was able to fund development of the Saturn V rocket, Apollo deep-space capsule, and Lunar landing module at unprecedented speed. But once the Apollo program had succeeded in putting 12 astronauts on the surface of the Moon across six successful missions, the funds for space exploration began drying up. In 1970, then-president Richard Nixon directed NASA to halt its deep-space exploration ambitions and instead focus on low-Earth orbit capabilities, effectively de-prioritizing (and largely de-funding) space exploration. Nixon set a precedent that has remained in place to this day: NASA would no longer be given special priority above other government agencies, and the United States would no longer invest in ultra-expensive space programs like what Apollo had turned out to be. After all was said and done, the threat of global nuclear war still had to be addressed. The race to the Moon had proven to be a valuable distraction from the realities of the Cold War during an era of impending nuclear apocalypse. With the lunar surface now in the rear-view mirror, the United States realized that while they had won the high-ground in space, from a militaristic standpoint, there wasn’t any strategic value to being there. Rather than putting all of their eggs in one basket as the Americans had done, the Soviets had decided to scale back their Moon program and instead focus on building the very first crewed space stations. Similarly to the launch of Sputnik, the existence of Soviet space stations became yet another threat to the United States' attempt at achieving global technological supremacy. While NASA was still launching missions to the Moon as late as 1972, the USSR had put the first space station, Salyut 1, in orbit as early as 1971. With intercontinental ballistic missiles continuously improving and high-flying spy planes being consistently shot-down while over enemy territory, both Cold War superpowers quickly realized that building up a strong presence in low-Earth orbit was of utmost importance. 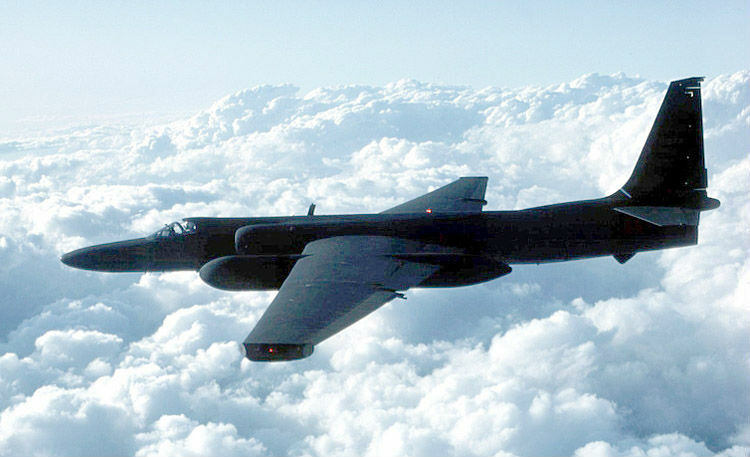 A United States Air Force U-2 surveillance aircraft. These things were getting shot down all the time. Image: Wikimedia Commons/U.S. Air Force. Fortunately, there was a loophole: an outer space solution to the intelligence gathering problem. The 1967 Outer Space Treaty had been signed and ratified by most members of the United Nations, including the USA and USSR. This treaty specified that weaponization and militarization of outer space was strictly prohibited. This meant that satellites operating in Earth orbit—even those designed to spy on enemy military installations (if that could even be proven)—were also immune to being purposefully destroyed by other nations. Whereas a U-2 spy plane can be shot down for trespassing on a nation’s airspace, spy satellites cannot. As a result, both the USA and USSR realized that the next big space prize was establishing a permanent human presence in Earth orbit, complete with crews capable of long-duration spaceflight and the ability to both launch and service space hardware—particularly Earth-observation platforms. Compared to low-Earth orbit, the Moon was a logistics nightmare (many days to make the journey, inability to quickly return to Earth in case of an emergency, and the necessity of expensive heavy-lift rockets in order to get there) with none of the strategic payoffs available at in a lower orbit. Just as competition between superpowers had created the Moon-race, it also led to the nearly five-decade hiatus on human deep-space activities and the renewed focus on low-Earth orbit infrastructure. Rather than fly back to the Moon or onward to Mars, NASA instead got to work building the Space Shuttle. Following the extremely high price tag associated with the Apollo program, the United States was looking to reboot its human spaceflight program with a more capable, economical, and flexible spacecraft—at least, that’s how it started out. Instead of making the huge leap from Earth to Moon, or Earth to Mars, NASA would instead focus on building up their low-Earth orbit capabilities as part of a more natural, step-by-step expansion into outer space. As a result of this new approach, the multi-functional Space Shuttle was conceived. The Space Shuttle has always looked way cooler than it actually is in practice. Image: NASA. But the Space Shuttle was too many things at once, and it wasn't particularly good at any one thing. It was capable of landing on a runway like an airplane, eliminating the need for an ocean splashdown and its associated recovery team. 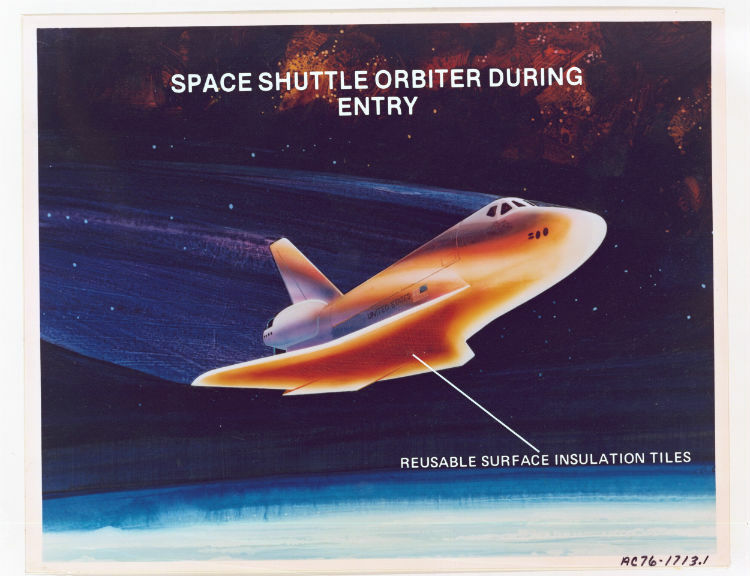 But the trade-off was that the complex wing structure made re-entry heat shielding vastly more complicated than a symmetrical bell-bottom capsule, and this ultimately made it so that the Shuttle wouldn’t be able to re-enter the Earth’s atmosphere from deep space (because it would pickup too much speed and take on too much of a heat-load), therefore restricting its operations to just a few hundred kilometers above Earth’s surface. By comparison, the Apollo capsule had been able to fly 400,000 kilometers (250,000 miles) to the Moon and back. The furthest a Space Shuttle ever got was 600 kilometers away from Earth—approximately 1/1,000th the distance of Apollo. Fortunately, this Earth-orbit restriction was fine and dandy because it aligned with NASA's new (boring) direction. The Space Shuttle also featured a gigantic cargo bay—the size of which was negotiated by the Department of Defense (DoD), who wanted to use the Shuttle for military applications, like launching some of its top-secret spy satellites into orbit. With NASA’s budget on the chopping block, the agency simply agreed to make itself useful to the DoD in order to justify the continued expense of investing in space exploration technology. The problem was that this cargo bay was often much larger than what was required. This added significant weight and size (not to mention complexity) to the Space Shuttle, and thus increased the cost of flying it even further. This is the Space Shuttle's complicated heat shielding system. Image: NASA. 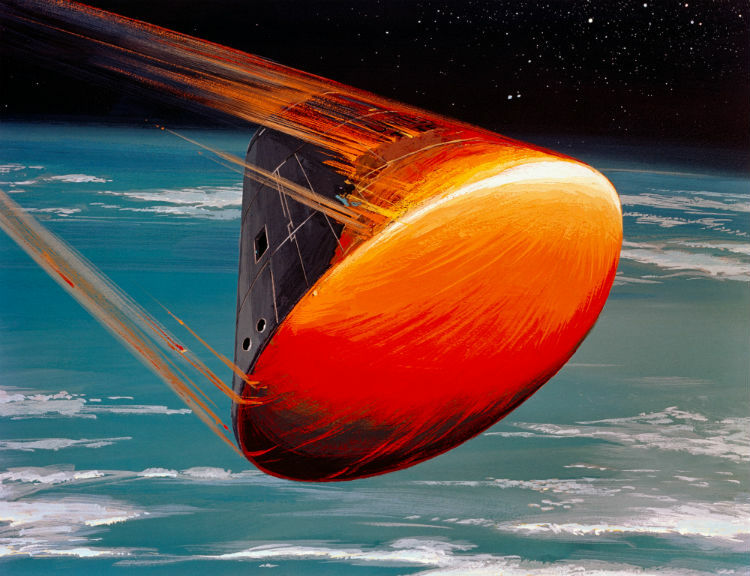 By comparison, Apollo's heat shield was capable of absorbing more extreme temperatures. Image: NASA. The Space Shuttle was also designed to be reusable. This was supposed to mean that NASA would save a significant amount of money on each launch, as they wouldn't need to maintain an ongoing production line of new spacecraft for each and every mission (as is done with the space capsule design). That was the plan, anyways. 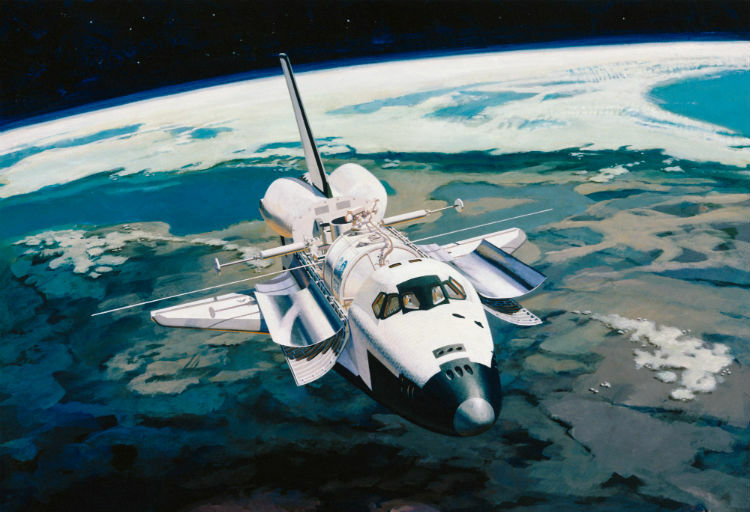 But by the time all of its required capabilities (such as those required by the DoD) were added in, the complexity of the Shuttle design made refurbishment and reuse far more difficult and costly than had been expected. These added difficulties contributed to a substantial delay in its maiden flight—STS-1 didn’t take place until 9 years after the last lunar landing, and wasn't finished in time to boost NASA's own first space station, Skylab, into a higher orbit. As a result, Skylab's orbit degraded to the point that it plummeted into Earth's atmosphere and burned up. To add insult to injury, since NASA had cancelled the Saturn V program, it no longer had a rocket capable of launching a new single-module space station. More disaster followed. 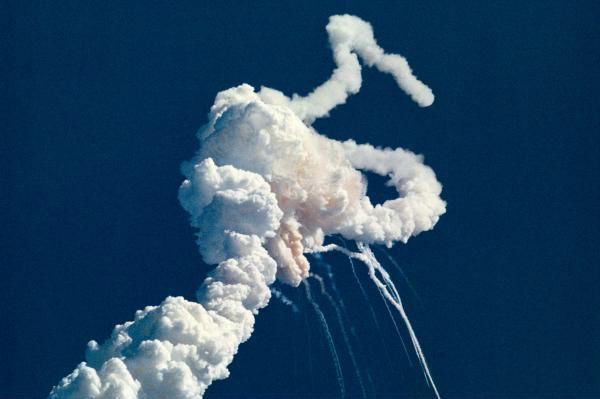 In 1986, Challenger blew up during launch, just five years into the Shuttle’s eventual 30-year lifespan, killing all seven crew members and resulting in a two and a half year launch hiatus. By the time the remaining Space Shuttles started flying again, the backlog of missions meant that the workhorse had to try and make up for lost time while also being more cautious than ever. Over the course of its lifetime, the entire Space Shuttle program ended up costing about $220 billion dollars (adjusted for inflation)—that works out to about $1.6 billion dollars per launch. By comparison, the cost of the Apollo program has been estimated at about $120 billion dollars (also adjusted for inflation)—$13 billion for each Apollo mission that flew to the Moon, and $20 billion for each Apollo mission that landed on the Moon. While Apollo may have cost substantially more than the Space Shuttle on a per-flight cost basis, the scientific knowledge gained by each Apollo landing was substantially more than what was gained on any given Shuttle mission. The costs between the two programs simply aren't comparable, because their mission parameters were of an entirely different class altogether. When the USSR dissolved and the Cold War ended, the NASA of the early 1990's found itself with a jack-of-all-trades Space Shuttle that they didn't really need. That's when opportunity came knocking. With the USSR’s space program dissolved, the newly formed Russian Federal Space Agency found itself with a substantially decreased budget and an aging Mir space station—not to mention the Soyuz spacecraft dating back to the 1960's (and still in operation to this day). Artist's impression of Freedom Station. Looks sort of familiar... Image: NASA/Tom Buzbee. With the Cold War ended, the United States came up with an idea that could solve a lot of problems simultaneously. Through cooperation, Russia and the USA could get the space station of their dreams if they were to bring in a gang of international partners (like Europe, Japan, and Canada) and split the costs between them. The Space Shuttle would be used to help construct the new multi-modular space station, while the Soyuz capsule would be used as a reliable and affordable crew and cargo transport for the foreseeable future. And all of this could be done under the guise of friendship, international cooperation, and ongoing peaceful relations (although, in recent time, this space-relationship has started to get a bit awkward). The first crew of three began living on the International Space Station (ISS) in the year 2000. Nearly 17 years on, the station has hosted a rotating crew of between 3 and 6 astronauts continuously, and current plans are for this arrangement to continue through 2024—and potentially even 2028. The most expensive hotel ever built. Image: NASA. 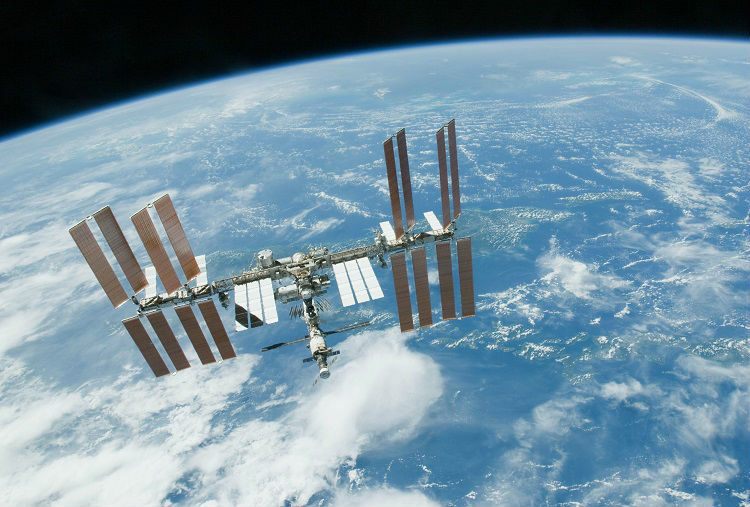 The problem with this is, again, the costs: so far, the ISS has cost $150 billion to construct and operate—and this number is only going to go up as its lifespan is stretched out for perhaps another decade. Operating costs alone amount to a further $6 billion per year, with NASA covering approximately half of the ongoing cost. While it's cool that we have a space station in continuous orbit around Earth with a rotating human crew living permanently on board, not a whole lot is going on up there. It's not like people are living on the Moon and studying its past and present geology. Instead, all of our deep-space exploration has been regulated to robots... And that's proven to be a very cost-effective arrangement. The Apollo-era moon race was an important distraction from the nuclear arms race. The Space Shuttle was strategically important for Cold War dominance of orbit. 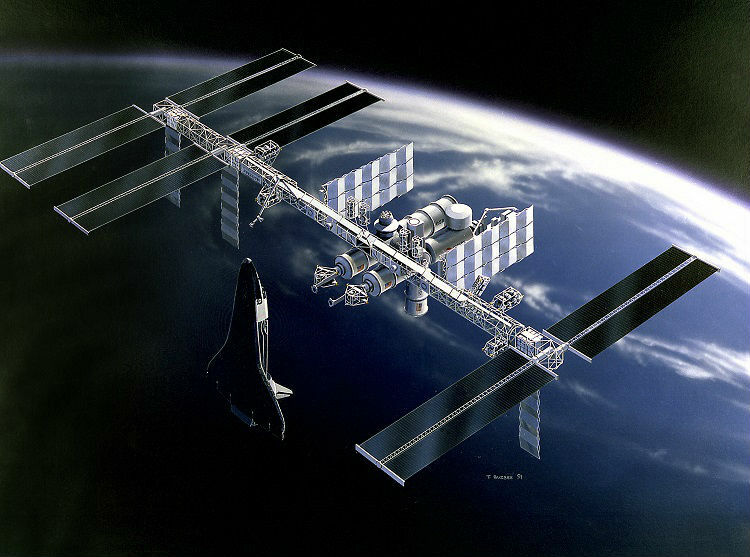 The International Space Station was politically important for international peace following the end of the Cold War. If we look at it pessimistically, the entire history of human spaceflight can be attributed to the international politics—particularly those surrounding the beginning, middle, and end of the Cold War. 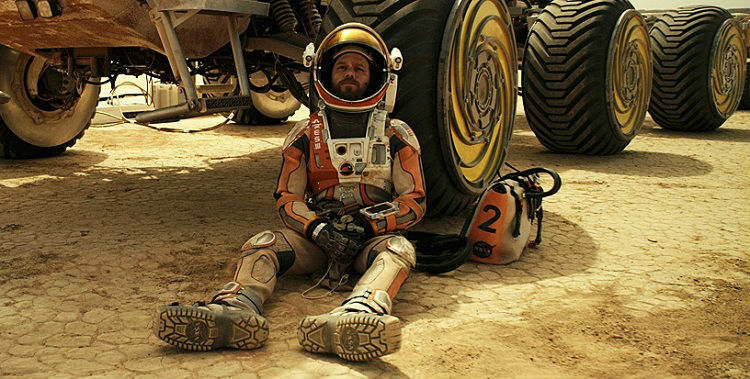 That look of hopelessness isn't because he's stranded on Mars; it's because of space politics. Image: The Martian (2015). It’s simply a matter of fact that robots can explore the Solar System significantly easier than human beings can. Apollo cost $120 billion for six human landings, each lasting a matter of hours or days. The Curiosity rover cost just $2.5 billion and it's been exploring Mars for five years. So, what would be better: six human moon landings, or fifty planetary exploration rovers? Assuming those rovers could go to just about every interesting celestial body in the Solar System, I may just go with the rovers, personally. There's also the fact that robotic exploration programs generally have shorter timescales and clearer goals—study a comet up-close, study the geological history of Mars, look for signs of past or present life in the Solar System, capture the first up-close images of Pluto, and so on. These missions can be tailor-made to the task at hand and carried out at a reasonable price; the same cannot be said of human spaceflight programs (just look at the SLS and Orion). If we're ever going to end humans back to the Moon or off to Mars, we'll probably need a really good political reason to go there. Until that happens, best start getting used to the view of Earth from orbit.